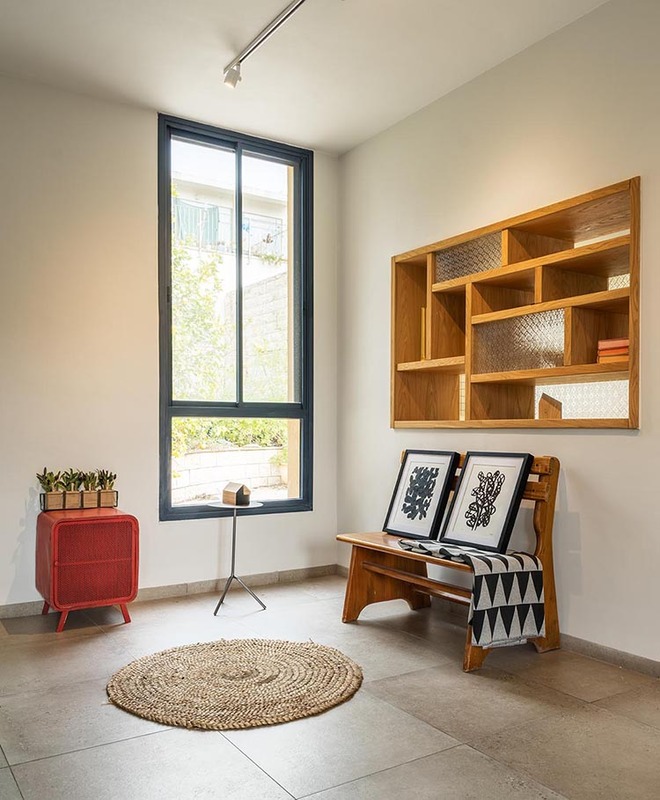 In Ein Hod, an artists' village founded in northern Israel the 1950s, Ori Dunetz and Eran Naim of EN Design Studio were tasked with creating a a "pstroal yet modern atmosphere" for a librarian and painter with grown children. To connect the pair of boxes that comprise the home, a "window" was created btween the kitchen and office. Furnishings were chosen from SAGA TLV, a gallery that serves as a "hothouse" for Israeli art and design. Architectural lighting was carefully arranged to spotlight future additions to the residents' art collection. Natural oak and stone are used throughout the house to enhance the soothing atmosphere. In the bathroom, wood shleves are built in, providing a perch for succulents. The floor is covered in 20-centimeter-by-20-centimeter painted tiles. To save money on the renovation, the designers repurposed the homeowners' original furniture. The dining table was sandblasted for a new look. The kitchen continues the theme of warm colors and natural oak, with an accent of cool blue on the window. Gray is used throughout the house to give the house a modern take on country living. The cabinets are natural oak with a matte varnish finish, the handles are integral aluminum, and the work surface is Caesarstone.